There is a narration with the video, so please make sure that your sound is on. If you are having trouble viewing the video, the reason could be that the network you are on blocks YouTube videos. 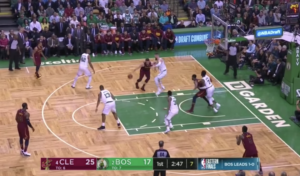 Embedded below is a video compilation of the “Scram Switch” the Celtics have been executing when Cleveland attempts to post the smaller Boston guards. The coverage differs slightly from the “Kick Out” scheme the Celtics have been deploying most of the year. With the “Kick-Out” coverage, a weakside big is looking to switch onto the screener as soon as he begins rolling. As you can see in the clips, the “Scram” doesn’t happen until the ball is thrown into the post. -As I mention in the video, Golden State was the first team I saw utilize the “Scram Switch.” For a video of their Scrams, click HERE. For my post on all of Golden State’s switching concepts, click HERE. -It seems that in the past 2 games, Stevens has started to encourage his guards to front the post with the “Scram” still coming as soon as the ball is thrown. With the post front, this scheme very much resembles the “Red” coverage that was featured last month.